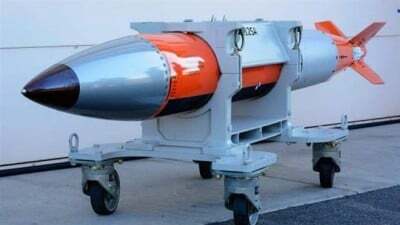 The US is stationing up to 20 of a new type of B 61-12 nuclear bombs at the Büchel air base in the Eifel region. Altogether they have 80 times the explosive power of the nuclear bomb exploded in Hiroshima. This was revealed in the German television program “Frontal 21” on Tuesday. The stationing of these bombs is part of the renewal of the American nuclear arsenal. “Frontal 21” referred to the current US budget plan, which indirectly refers to these plans, saying that the weapons will be integrated into German fighter-bombers starting in the third quarter of 2015. At the same time, additional nuclear weapons locations in Europe are being upgraded with new B 61-12 nuclear bombs. These include the airbases in Incirlik, Turkey and Aviano, Italy. Der Spiegel already reported last year that the first bombs costing about $10 billion should be available in Europe in 2020. It said that the expansion of the air base in Büchel will cost an estimated $154 million and that Germany will cover one-fifth of this. That nuclear armament is taking place in Germany, and the fact that—after the terrible crimes of the German military in two world wars—the German military could drop nuclear bombs is horrifying. It also violates German and international laws. The renewal of US nuclear weapons in Germany is a provocation against Russia and raises the danger of a nuclear war in Europe. The current edition of Spiegel Geschichte (Spiegel History), under the headline “The bomb: The age of nuclear intimidation”, is devoted to the growing danger of a nuclear war. It gives an overview of the massive build-up of arms, which has taken place “above all since the outbreak of the Ukraine crisis”. In an “arms race 2.0,” the nuclear powers are modernizing their nuclear weapons “at great expense”, it says. According to a study by the Bulletin of Nuclear Scientists, Washington wants to spend about $350 billion on nuclear armaments in the next decade alone, including a new class of nuclear U-boats, new nuclear weapon-bearing long-distance bombers and tactical fighters, a nuclear cruise missile and the building of new nuclear weapons factories and simulation facilities. Russia is also “in the middle of a broad modernization of its strategic and non-strategic nuclear armed forces”, according to a study, which says that two new Borei U-boats loaded with intercontinental nuclear rockets are “completely operational”. Furthermore, Moscow is working on a new strategic stealth bomber and, at the same time, is developing a new intercontinental rocket called “Sarmat,” which can carry up to 15 nuclear warheads. The buildup of nuclear weapons in Büchel is taking place with the support of the German government. This confirms that German imperialism is not a “peaceful” intermediary between the nuclear powers, as it would like to present itself, but plays an active role in a development that threatens the survival of the entire human race. About one year later, the largest NATO manoeuvre to take place in Europe in decades, Trident Juncture, is scheduled for the end of September and the buildup of nuclear weapons is in full swing.